Iris, in ancient greek translates as 'rainbow', and the goddess Iris was thought to use the rainbow as a bridge between heaven and earth. This shape reflects a symbol of power and majesty. The Callida is shown in 18k Yellow Gold, with a centre diamond of 1ct. Round Brilliant Cut, G Colour, SI1 Clarity, 6 grain set diamonds below 0.16cts total weight. The Iris bands are shown with 18 Round Brilliant Cut diamonds, VS2, 0.18ct total carat. The Iris Wedding Bands sit perfectly on either side of the Callida Engagement Ring. or 6 payments of $2,989 with What's this? This set combines the Callida Engagement Ring with the Iris Wedding bands. The Iris Wedding bands create the perfect teardrop arch shape. Iris, in ancient Greek translates as 'rainbow', and the goddess Iris was thought to use the rainbow as a bridge between heaven and earth. 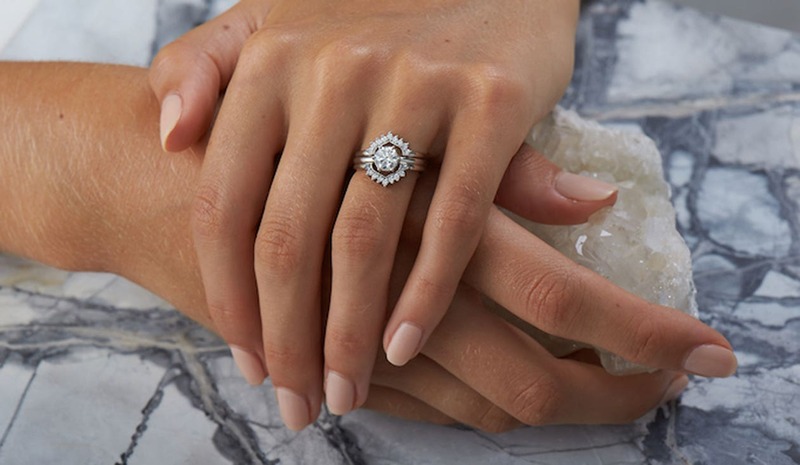 This shape reflects a symbol of power and majesty, the petal segments each set with pear shaped diamonds cascade elegantly forming the perfect frame for the Callida engagement ring. Callida means ‘the most beautiful’, and embodies elegance and eternal affection. At its heart is a brilliant cut, 1 carat solitaire diamond. Beneath the setting is a band of pavé set diamonds for a secret layer of sparkle.